Mazda earlier this year joined the ranks of OEMs stressing collision repairers should conduct diagnostic scans on every vehicle. CCC reports average repairable vehicle in 2017 was 5.9 years old, which translates to the 2011-12 model year. The average totaled vehicle was 9.64 years old, which works out to the 2007-08 model year. The average car on the road was 11.6 years old, according to IHS Markit. That only takes us back to the 2005-06 model year. Every vehicle needed to have a tire-pressure monitoring system by 2008. Airbags were first mandated on all cars since the 1998 model year and everything else since 1999, according to the National Highway Traffic Safety Administration. Advanced airbags — the ones which are “smart” enough to avoid deploying when a kid is in the front seat — first appeared in the 2004 model year and were phased in between calendar years 2003-06. 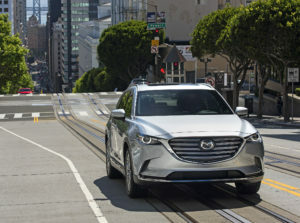 Electronic stability control dates back to at least the 2005 model year on one Mazda — and it was mandated on all Mazdas by the 2012 model year. Mazda appears to have begun including it standard on some models starting with the 2007 model year. The NHTSA expected 71 percent of all vehicles on the road to have had ESC by 2011. Mazda also in the January statement reiterated its position on OEM parts from 2011 and directed shops to its repair procedures. “Mazda North American Operations also recommends that only Mazda Genuine Parts be used when repairing the vehicle. 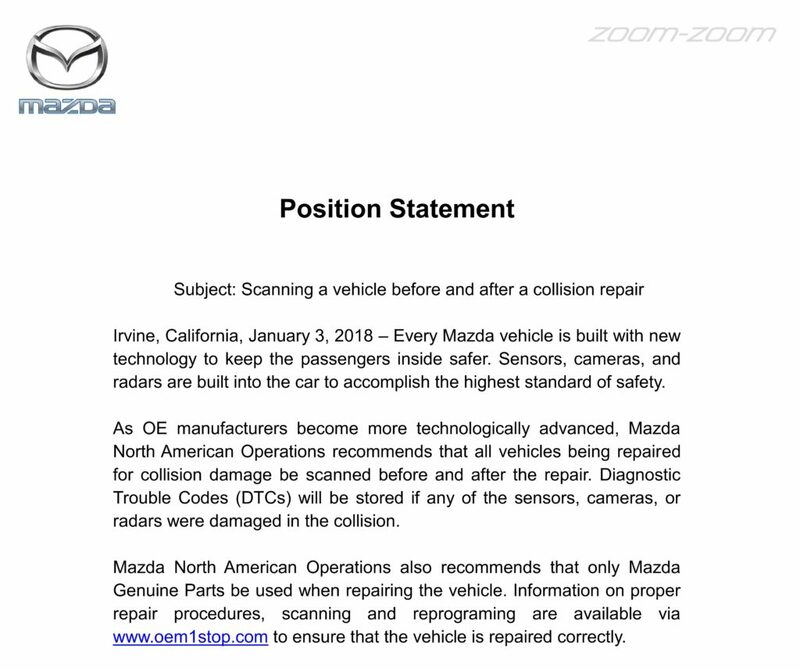 Information on proper repair procedures, scanning and reprograming are available via www.oem1stop.com to ensure that the vehicle is repaired correctly,” Mazda wrote.